French novelist Louis-Ferdinand Celine is considered a clear, honest voice of the 1930s and 1940s. 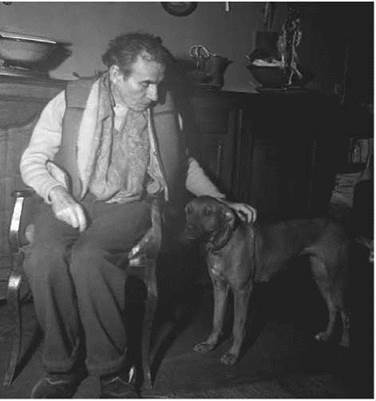 It was not until the 1960s, however, that the literary community began to accept Celine as a major figure and to evaluate his work in unbiased terms. Openly vocal about his anti-Semitism, Celine was accused of collaborating with Nazis during World War II, and he faced an opposition so strong that his work faded into obscurity. Only when Celine’s name was cleared twenty years later were the French allowed exposure to his life and work. When his writing became available to the public, readers learned that Celine was a skilled artist whose experiments with language and the structure of the novel have influenced writers all over the world. Cosmopolitan Upbringing. Louis-Ferdinand Des- touches, who adopted the pseudonym Celine from his grandmother’s maiden name, was born in Courbevoie, France, a suburb of Paris, on May 27, 1894. He was the only child of Ferdinand-Auguste Destouches, an insurance executive, and Marguerite-Louise Guilloux Des- touches, a business owner. At the age of thirteen, Celine was sent to schools in England and Germany to learn the languages of those countries; such cultural exposure was unusual for a middle-class French boy. World War I. Celine enlisted in the French cavalry in 1912, and soon after, Europe erupted in war. Beginning with the assassination of Austro-Hungarian archduke Franz Ferdinand in 1914, the countries of Europe aligned with Germany on one side and the Allied powers—France, Russia, and the United Kingdom—on the other in an attempt to establish control over the region. France provided over 8 million troops to the cause, two-thirds of whom were either killed or wounded during combat. Celine was one of these, sustaining a grave injury to his arm while he was on the front line in Flanders. Afraid that doctors would amputate his arm instead of trying to save it, Celine refused anesthesia so that he could monitor the doctors’ work. Because of his arm injury, as well as severe damage to his hearing, Celine was granted a three- month convalescent leave in January 1915 and underwent surgery on his injured arm. Soon afterward, he was judged unfit for further combat duty and released from military obligation with a medal for heroic conduct under fire. His right arm remained partially paralyzed for the rest of his life. Celine Becomes a Doctor. In 1915-1916, Celine worked in the passport office of the French Consulate in London. He then spent a year working for a French lumber company in Africa before returning to France and taking a position with the Rockefeller Foundation. On behalf of the foundation, he toured the French province of Brittany and gave lectures on tuberculosis. At the same time, he studied medicine at the University of Rennes, where he received a degree in 1919. He married that same year. After earning a medical degree in 1924, Celine entered private medical practice and settled in Rennes with his wife and young daughter. Conventional married life, however, did not appeal to him, and he left his family in 1925 to work for the League of Nations—a precursor to the United Nations created after World War I—traveling throughout Europe and North America on its behalf. By the late 1920s, Celine was practicing medicine in France again. He took a position with a municipal clinic in 1931, where he worked almost exclusively with the poor. From that point until the end of his life, Celine practiced medicine only among the needy, despite the financial hardships associated with that choice. He argued that he could not in good conscience make money from the suffering of others. Celine Turns to Literature. When he was thirty-two, Celine began writing fiction while working as a doctor. His first work, a novel titled Journey to the End of the Night, took him five years to write. When it was finally completed in 1932, the one-thousand-page manuscript was submitted to two French publishing houses, Gallimard and Denoel. Gallimard found the book too controversial, but Robert Denoel, a new publisher who had debuted several other controversial manuscripts, accepted Celine’s novel. In an effort to separate his medical career from his literary one, the author published the work under his Celine pseudonym. When the Soviet Union would not send him royalties from the Russian translation of Journey to the End of the Night, Celine visited the country in 1936. As a result of that trip, Celine wrote the first of four political works that attacked the Soviet Union, calling it a vicious dictatorship based on materialism. According to Celine, citizens of the Soviet Union lived in filth and were exploited by a corrupt new ruling class—the Communist Party. During World War II, as France became largely occupied by German forces, Celine wrote several pamphlets that were viewed as anti-Semitic, or negative toward Jews. When Allies landed in Normandy in June 1944, Celine decided to leave Paris because he predicted he would soon be arrested, denied a fair trial, and quite possibly be executed on charges of collaborating with the enemy due to his anti-Semitism and hostility toward communism. After Celine and his third wife, whom he had married the year before, left Paris in July 1944, his apartment was ransacked, and his library and papers destroyed. Celine visited hospitals in Berlin and settled in a town north of the city. In November 1944, Celine moved to the German town of Sigmaringen, where the wartime French Vichy government, which operated under the authority of the Germans, fled after the liberation of France. There he worked as a physician until he traveled to Copenhagen, Denmark, in March 1945, supposedly to recover money that he had hidden in a friend’s backyard before the war. In April 1945, a French court issued a warrant for Celine’s arrest as a Nazi collaborator. When French officials in Copenhagen demanded that Celine be exiled immediately, the Danes responded by imprisoning him for fourteen months and his wife for two. In poor health, Celine was hospitalized in February 1947. When he recovered four months later, he was freed on the condition that he would remain in Denmark, where he lived until he was granted amnesty in April 1951. He spent the last ten years of his life just outside of Paris, where he worked as a physician until he died from a stroke in July 1961. Henry Ford (1863-1947): American automobile maker who is credited with making his Model T affordable enough for the average person by using an assemblyline construction process that reduced the time it took to produce a car. Robert Graves (1895-1985): English poet, novelist, and scholar who won the James Tait Memorial Prize in 1934. Carl Jung (1875-1961): Swiss psychiatrist who introduced the idea of archetypes—sets of basic ideas and concepts that he felt all humans shared—to the field of psychiatry. Fernando Pessoa (1888-1935): Considered one of the greatest Portuguese poets of all time. Pablo Picasso (1881-1973): Preeminent Spanish artist who worked in a variety of media, including paint and ceramics. Khalil Gibran (1883-1931): Lebanese poet and artist whose best-known work is The Prophet. Celine’s contribution to literature is primarily a result of his use of the French language—including all the grit and grime of street slang—and unconventional plotting. His novels are long and composed of crude first-person narration and disjointed plots, oftentimes disorienting the reader. Revolutions in Form and Language. Celine’s controversial novels are marked by misanthropic narrators, freewheeling verbal attacks, ferocious humor, and squalid settings ranging from the jungles of Africa to the factories of Detroit. His unrestrained language is a unique combination of French slang, profanity, street grammar, and near-delirium, while his episodic plots are laced with acidic satire. Celine’s work has often been compared to that of earlier writers, including Arthur Rimbaud and Charles Baudelaire. Some argue that Celine’s novels are unmatched in their anger and depravity. While it is true that other writers had tackled topics like madness and rage, most of these representations had been drawn from the language of the educated and confined by the limits of the traditional novel form. Celine’s peculiar approach—to match the language and form of the novel to its theme and to the characters themselves— led to new interpretations of the novel as a literary form. No longer could readers observe the delirium of characters with the protection of refinement and convention. In Celine and other writers such as Mark Z. Danielewski, who also uses slang and unconventional plotting techniques, one is immersed in the world of the delirious—in the exact way the novelists choose—through the language the novelists use. Art as a Powerful Force. Although Fairy-Tale for Another Time is not considered a strong novel in itself, it presents Celine’s concept of artistic creation. Amidst a backdrop of World War II, Fairy-Tale is Celine’s attempt to incorporate other arts, including painting, film, and ballet, into a novel. He portrays art as a force that can make or unmake the universe; art’s evil, destructive quality is tempered by a character whose purpose is to restore harmony and balance. The success of Fairy-Tale is in Celine’s construction of a work of art that is not restricted by one form or point of view. Because of this freedom, it invites readings from a variety of perspectives. Legacy By the time of his death in 1961, Celine had claimed a place in contemporary French literature. Celine is widely known for his influence on other writers because he created new possibilities for what the novel as form could be. In Celine and His Vision, Erika Ostrovsky noted that Celine’s work ‘‘consists of the creation of a new tone, a literary ambience which pervades an entire sector of modern letters and exceeds the limits of national boundaries or personal orientation and background.’’ Among those he is credited with influencing are Henry Miller, William Burroughs, and Thomas Pynchon. The Brief, Wondrous Life of Oscar Wao (2007), a novel by Junot Diaz. Written in the first-person point of view, this novel captures the Spanish-English slang of its Dominican American narrator. A Midsummer Night's Dream (1595), a drama by Shakespeare. This play introduces characters whose language is virtually incomprehensible to other characters because of its combination of slang and botched attempts at ''proper'' language. Adventures of Huckleberry Finn (1884), a novel by Mark Twain. Twain took extreme care to represent the language of his characters accurately in this American classic, even pointing out his efforts in his introduction to the book. The Sound and the Fury (1929), a novel by William Faulkner. In this work, Faulkner attempts to capture the language of the South, including that of a developmentally disabled protagonist. Journey to the End of the Night. According to Irving Howe in his book A World More Attractive: A View of Modern Literature and Politics, Journey to the End of the Night is composed ‘‘as a series of loosely-related episodes, a string of surrealist burlesques, fables of horror and manic extravaganzas, each following upon the other with energy and speed.’’ Writing in the New York Times, Anatole Broyard claimed that ‘‘in his first and best book, Journey to the End of the Night, Celine had hardly a good word for anybody, yet you felt that he was in closer touch with the human race, with people in the depths of their souls, than any other author in this century. And though Journey was distilled out of disgust, the aftertaste was not sour—as it so often is with modern French novels—but bittersweet. His disgust was a kind of curdled love.’’ Journey to the End of the Night was extraordinarily popular throughout Europe. In the New York Times Book Review, Mavis Gallant explained that ‘‘Celine’s dark nihilism, his use of street language, the undertow of mystery and death that tugs at the novel from start to finish were wildly attractive to both Left and Right; both could read into it a prophecy about collapse, the end of shoddy democracy, the death of sickened Europe.’’ Leon Daudet of the reactionary newspaper L’Action Francaise fought unsuccessfully to have Celine awarded the prestigious Prix Goncourt. Soviet revolutionary Leon Trotsky wrote in the Atlantic Monthly that Celine ‘‘walked into great literature as other men walk into their own homes.’’ The reading public made Journey a best seller. ‘‘Celine’s cynicism and denunciations seemed to speak for everyone...,’’ Allen Thiher wrote in his Celine: The Novel as Delirium, ‘‘[His] popular, obscene language was like a violent gust of fresh air breaking into the literary climate.’’ Attacks against the book’s obscenity merely provoked more interest and increased sales. 1. Slang is a nonstandard variation of a language, and using slang in a novel drastically alters the overall effect—the tone and sometimes even the meaning— of the work. In order to understand how the use of slang changes the meaning and mood of a text, choose a passage from a classic novel written in proper English—something by Charles Dickens or Jane Austen would be appropriate—and rewrite it in a slang of your choice. For example, you could take the opening page or two of A Tale of Two Cities and rewrite it in text-message language. 2. Read Journey to the End of the Night. In what ways does Celine challenge popular conceptions of ‘‘good’’ and ‘‘bad’’ characters? Is the novel moral or immoral? Cite specific examples from the text. 3. Journey to the End of the Night was praised by both left- and right-wing political extremists. Consider Celine’s controversial political beliefs. Why do you think Celine’s novel appeals to both groups? What evidence can you find to determine if he presents a clear-cut political stance, both in his life and in his work. Bree, Germaine, and Margaret Guiton. The French Novel from Gide to Camus. New York: Harcourt, 1962. Hayman, David. Louis-Ferdinand Celine. New York: Columbia University Press, 1965. Hewitt, Nicholas. The Life of Louis-Ferdinand Celine: A Critical Biography. Oxford: Blackwell, 1998. Howe, Irving. A World More Attractive: A View of Modern Literature and Politics. Far Hill, N.J.: Horizon Press, 1963. Knapp, Bettina L. Celine: Man of Hate. Tuscaloosa: University of Alabama Press, 1974. Matthews, J. H. The Inner Dream: Celine as Novelist. Syracuse, N.Y.: Syracuse University Press, 1978. Ostrowsky, Erika. Celine and His Vision. New York: New York University Press, 1967. Thiher, Allen. Celine: The Novel as Delirium. Piscataway, N.J.: Rutgers University Press, 1972.